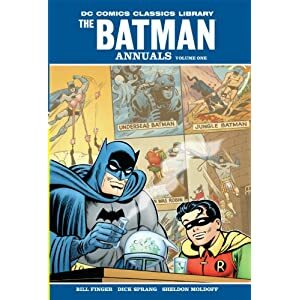 I'm looking to purchase Batman Annuals #1. Amazon's website doesn't mention if it's in full color. Does anyone know? Plus looking to get Superman From the Sixties. Also would like to know if thats in full color. The first is hardcover and the second is softcover. Re: DC Comics Hardcover/Softcover books? i think that both of them are in color. Pretty much the only thing DC publishes that isn't in color is their "Showcase Presents" line of trades and their "Batman: Black and White" books. Volume 2 comes out in August. Are there any plans for Superman Annuals? I would like to get all the DC 80-Page Giants and Annuals but it might be quit costly. I have seven on order and plan on ordering seven more next month. I haven't heard of any, and I don't know whether they would duplicate anything already in print. I love the Giants; they really bring back my youth. Yep-the Giants and the Annuals rule. Beginning in the late 60s ,I thought that the cover art was too cluttered. One Jimmy Olsen Giant only had 3 stories.